ProcessKO 4.57 Portable » SoftLab - портал portable-софта! ProcessKO - полезная системная утилита, с помощью которой можно легко и быстро завершить / перезагрузить любой повисший процесс или приложение. ProcessKO is for professionals and experienced users, with very good PC know-how (knowledge)! ProcessKO is a small useful tool to quickly kill a running or hanging process / program. It is not uncommon among developers or program-testers that the programs do not function properly or that you can not even close the programs (using the Task Manager) usually its always the same candidates. Creating "Dearest-KO´s" for fast killing processes or programs! One knows this problem, especially as developers / beta tester: When a program freezes,than you call the task manager CTRL+ALT+DEL , and find that frozen program then you have to find and select the option "End Process", and finally you have to confirm the message, "Are you sure you want to terminate the process" with "yes". One can save many hand moves and also time! Now it´s easier then ever!... 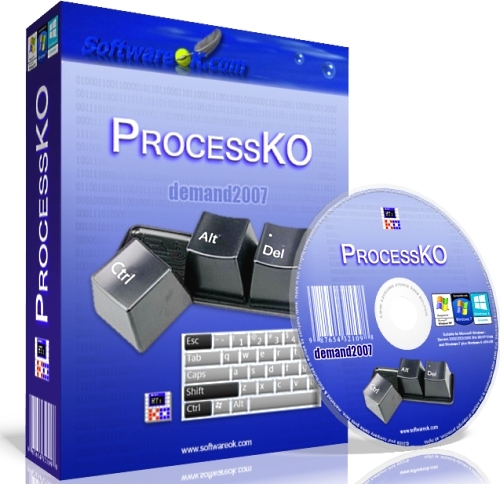 With ProcessKO it goes faster and the program can also be restarts from there. ProcessKO does not have to be installed and can be executed easily from the desktop. It´s one small / portable utility for Windows PC-s and is a small usb-stick friend. а что контрл + альт + дел уже не в теме?